Then again, having now watched it, I can see why something like this would be an acquired taste. Selling a show about a doctor in pre-revolution Russia and his adventures in medicine at the world’s most depressing hospital sounds like a tall order. Plus, it’s gory as hell. Like, I watch “Game of Thrones” and “The Walking Dead,” and this is so much worse than anything either of those shows have ever done. But this is undoubtedly quality TV. It takes a little time getting its footing, but once the show hits its stride, it adeptly mixes black comedy, psychological drama and, yes, gross-out medical experiments. Plus, the entire series right now is two seasons of four 22-minute episodes eacg. It’s the world’s easiest binge. Obviously, what really helps “A Young Doctor’s Notebook” stand out is its leads. Radcliffe plays the titular doctor in 1917, while Hamm plays the older version of him in 1935. The show is framed around Hamm reminiscing about his time at his first hospital, and he even has conversations with his younger self that add either levity and gravitas given the situation. It’s jarring at first, but it’s a cool narrative element that allows these two talented actors to dominate the screen. Hamm’s older doctor is like what would have become of Don Draper if he hadn’t gotten his drinking in check, though his morphine addiction is a much more dangerous vice. He spends some scenes as his usual dapper self, and others as someone who can barely function without a syringe constantly jammed into his arm. As usual, Hamm’s the man. Though it clearly took him a little time to fully master a British accent. Radcliffe has come a long way since playing The Boy Who Lived. His young doctor is, quite frankly, a little prick. He starts out nice enough, but once the morphine addiction starts, he becomes an awful person with no empathy who only cares about getting his fix. Just like Hamm, Radcliffe navigates the comedy and drama with ease. The idea that he would grow up to be Jon Hamm is as laughably weird as Zac Efron turning into Matthew Perry in “17 Again,” but the show sells it well enough. The two of them also have fantastic chemistry, with Hamm trying to steer his younger self in the right direction with mixed results. Kids, don’t do drugs. This show is a must-watch for fans of black comedies, hospital dramas and anyone who either loves British TV or ever wanted to see Harry Potter and Don Draper share the screen. It’s like a less ridiculous, grimier version of “Scrubs” in that it’s primarily a comedy with a few sharp dramatic elements thrown in for good measure. And I believe this is where our opinions on this show differ, right Anamika? ANAMIKA: Right. There’s nothing funny about Daniel Radcliffe pulling out part of a man’s jaw or delivering a stillborn baby in the frozen Russian winter. But the dark humor that comes with Radcliffe’s naive enthusiasm and pride in his academic excellence is the comic relief the show needs. Not to mention the constant mention of Leopold Leopoldovic. I think the show is a drama infused with comedic elements. Either way, the show is incredibly dark. Even the humor is pretty grim. One can argue whether Radcliffe pulling part of a man’s jaw in the attempt to extract a tooth is part of the show’s dark comedy. But the same cannot be said about the third episode in season one where Radcliffe amputates a girl’s foot – I kept my eyes closed for that one. No matter the genre, there’s not question that Harry Potter has grown up. Gone are the horrible memories of Radcliffe’s fake crying and sub-par acting we all remember from the Harry Potter movies. His character has depth, its believable and does a great job of walking the line between comedy and drama. Moving ahead to the future, Jon Hamm has a smaller role in this miniseries. Radcliffe is really running the show here. 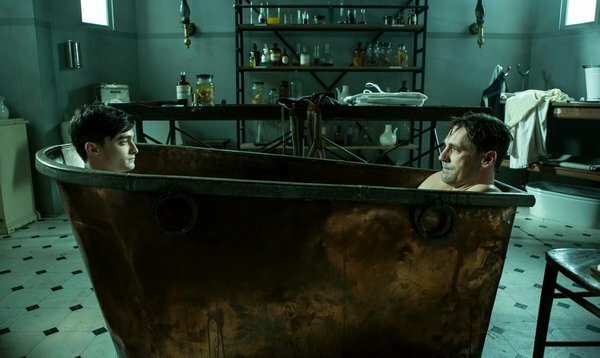 But its great to see Hamm play a character in a less glamorous period of a time on the other side of the world. One setback is that British accent. It’s more a posh American accent than a proper British one. That’s one thing I don’t quite follow about this show. Why does everyone speak English when the show is set in Russia? It makes the plot seem less authentic. I know it’s like the “Sound of Music” or “Les Miserables” in that the characters speak perfect English but clearly play characters that would speak another language. But a few Russian words or some other representation of Russian culture would help us buy that part of the characters’ identities. That being said, the script in the opening credits is a nice touch. If you have the stomach for a little gore and are dying to see Don Draper and Harry Potter on the same screen, “The Young Doctor’s Notebook” is a the perfect, short binge-worthy show. You can finish season one in less than two hours and decide if you want to move on to season two. I’m still trying to make that decision, but I’m leaning heavily toward digging up season two.